Mt. 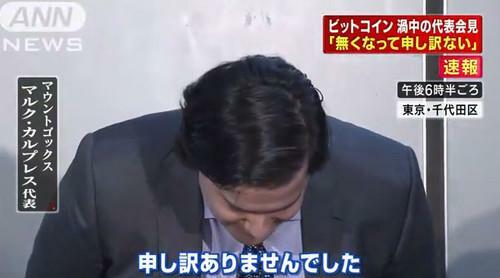 Gox CEO Mark Karpeles bows in ritual apology on Japanese TV while at a press conference on Feb. 28, when the bitcoin exchange filed for bankruptcy protection at the Tokyo District Court. Mark Karpeles, CEO of the now-bankrupt Bitcoin exchange Mt. Gox, is auctioning off Bitcoins.com, a site Karpeles launched last year to provide information around the digital currency. The domain will be sold July 24 by the U.S.-based auction house Heritage Auctions, with an opening bid set at US$185,000. The sale is expected to fetch as much as $750,000. Mt. Gox was once the largest online exchange for buying and selling bitcoins, but was forced to file for bankruptcy earlier this year after a massive hacking incident, incurring debts of more than $63 million. Bitcoins.com has been owned and operated by Tibanne Co., Ltd., the parent company of Mt. Gox. It is different from the singular Bitcoin.com, which is owned by Blockchain, which makes a Bitcoin wallet app. Proceeds from the sale of Bitcoins.com will partly be used to provide relief to Bitcoin holders who lost money in the collapse of Mt. Gox, Karpeles said in a statement shared with Coindesk, a Bitcoin news site, and confirmed via email to the IDG News Service. The money will also be used to keep Tibanne running, Karpeles said, but at least half of the sale price will be paid to benefit Mt. Gox creditors. "It is difficult for us at this time to provide a more accurate figure," he said. Despite Mt. Gox's fall, interest in Bitcoin remains high among businesses and investors alike. A number of other online exchanges like Coinbase and Circle have raised millions of dollars from prominent investors like Andreessen Horowitz, which could give them the cash to buy up Mt. Gox's domain. That is, if they want to.